Visitors can view the plenary session of the Chamber of Deputies from the visitors' gallery. 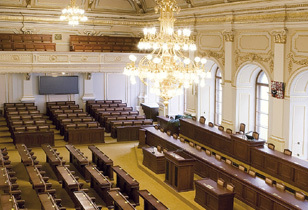 Meetings of the Chamber of Deputies are held at specified dates and times, marked in the timetable as the Chamber of Deputies, and on some occasions also in so-called variable weeks. A visit cannot be booked in advance. When entering the building, individuals must present a valid ID card or passport at the reception desk at Sněmovní 4. Groups of visitors, such as schools, must also present a list of names of the excursion participants, supplemented with ID card or passport numbers of visitors aged over 15. The maximum time for a visit to the visitors’ gallery by a larger group is set at 30 minutes for capacity reasons. Meetings of the Chamber of Deputies are not held on Mondays. On Tuesdays, meetings usually begin at 14:00 o'clock, on other weekdays at 9:00 o'clock. You can find more detailed information on the possibility of visiting a sitting in the Information Centre of the Chamber of Deputies.